One sentence in a New York Times article caught Larry Pratt’s eye and set the scientific investigation in motion. “It seemed far-fetched,” Pratt said. 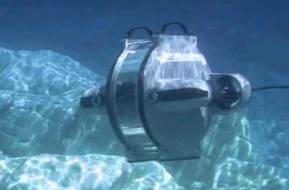 Pratt, a physical oceanographer at Woods Hole Oceanographic Institution (WHOI), knows something about ocean currents. He found it hard to believe that tiny eel larvae, only a few millimeters long, could passively float across the powerful currents of the Gulf Stream in the North Atlantic and the continental shelf break—heading toward freshwater streams and lakes, where they spend their adult lives before returning years later to the Sargasso Sea to spawn and die. Pratt had tapped into a still elusive mystery that has intrigued scientists for centuries: the epic migration and unusual life cycle of eels. Aristotle mused that eels emerged from the mud of river bottoms, and it was not until 1923 that Danish biologist Johannes Schmidt, after a 15-year search, tracked down young larvae of both American (Anguilla rostrata) and European eels (Anguilla anguilla) in the Sargasso Sea. He assumed this was the eels’ spawning ground, but to date, no adult eels have ever actually been observed there. Meanwhile, four-inch glass eels, a juvenile life stage, have been found and fished in coastal streams in America and Europe for millennia, but it’s just as much of a conundrum how they get there. 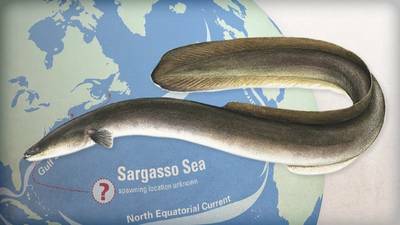 The mystery of the American eel starts and ends in the Sargasso Sea, the only sea in the world without a coastline. The Sargasso Sea is surrounded by a clockwise-circulating system of ocean currents that together create the North Atlantic Subtropical Gyre. It is named after seaweed of the genus Sargassum, which floats abundantly on its surface. Pratt brought the puzzling New York Times article to his WHOI colleague, physical oceanographer Irina Rypina, who agreed that for the eel larvae to find their way, they must have more complex behavior beyond just drifting passively. But though the pair knew plenty about the complex currents of the North Atlantic, they did not know much about fish. So they made an inquiry to WHOI’s Biology Department. “I got an email saying, ‘two physical oceanographers want to know something about eels,’ ” said WHOI biologist Joel Llopiz. He leaped in to explain the eels’ life cycle, which has five different anatomical stages, each corresponding to locations on their migratory path. Perhaps some overlooked biological features were key factors that allowed larvae to reach the coast? The team enlisted a fourth member, physical oceanographer Suzan Lozier of Duke University, and created a computer model that incorporated a range of biological and oceanographic data to simulate the larvae’s travel patterns. The model also accounted for the dramatic population loss of larvae within the first year of the migration. Rypina said that while female eels may lay on the order of five million eggs, only about one-third of those hatch into larvae. And according to their models, only 0.2 percent to 0.45 percent of the larvae reach continental shelf waters. Using their model, the researchers tested several possible ways that the larvae might get to fresh water. They included passively drifting along with currents, actively swimming but without the ability to maintain direction, and swimming in a particular direction. The model simulations showed that many more virtual eel larvae survived and reached coastal waters when the larvae swam in a preferred direction—to the southwest—than virtual larvae that passively drifted with the ocean currents or randomly changed their direction. The results, published in 2014 in the journal Limnology and Oceanography, all but eliminate the drifting hypothesis in that fateful New York Times article. Instead, the study indicates that, “these little guys, despite how small they are, can actually swim,” Llopiz said, and that swimming, even at a modest larval speed of about 0.13 miles per hour, plays an essential role in their survival. The model results also indicates that if the larvae are spawned in the southwest corner of the Sargasso Sea and start their migration there, they are more likely to reach the coast. 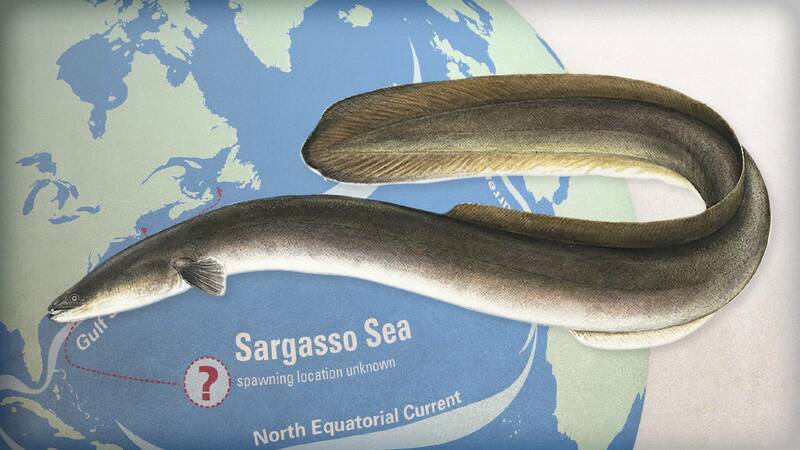 That’s a clue that may help point scientists toward finally finding exactly where adult eels go to spawn. Next, the team turned to another enigma: What factors, other than random chance, might affect how many larvae survive from year to year? The answer is important, because populations of both American and European eels have declined significantly. Eels once thrived in estuaries and rivers from Greenland and along the United States East Coast to northern South America, migrating upstream and far inland to populate the Great Lakes. They similarly prospered across the ocean in European watersheds. Dams now block access to many of the eels’ former habitats. Overfishing has also taken a huge toll recently, as the market for eels has increased. U.S. fishermen captured 20,000 pounds of glass eels in 2013, most exported to Japan, where up to 100,000 tons of unagi are consumed each year. The team used its model to test a hypothesis that the Gulf Stream may play a role in how many larvae complete their journey. The Gulf Stream generally bends eastward from the U.S. coast at Cape Hatteras in North Carolina. But sometimes it overshoots and veers away at a location farther north. Their new study, published in June 2016 in Limnology and Oceanography, suggests that when the Gulf Stream overshoots, nearly twice as many larvae can make it to the continental shelf waters as can when the Gulf Stream follows its usual course. An overshooting Gulf Stream may help propel larvae closer to the coast. Or the Gulf Stream may weaken a southward-flowing current called the shelf break jet, which may hinder eel larvae from reaching their destination. Next, the researchers hope to explore whether larvae may be able to orient themselves to overcome barriers along their arduous journey to fresh water by using Earth’s magnetic field for directional clues. As the scientists nail down more specifics of how ocean circulation changes and navigational ability affect larval survival, they can provide better predictions for how to sustain eel populations and eel fisheries, especially as the ocean conditions continue to change in the future. Of course, the mystery can’t be completely solved until the researchers confirm where the eels spawn by seeing them spawning with their own eyes, something that still hasn’t been achieved in a century of research. “It’s remarkable in this day and age that the location is still elusive,” Llopiz said. This research was supported by funding from the National Science Foundation. Results were published in Limnology and Oceanography (2014) by Irina Rypina, Larry Pratt, Joel Llopiz, and Susan Lozier, and (2016) by Rypina, Pratt, and Lozier.